Looking to liven up a boring or stale course? Here’s an idea: Try something unexpected like flipping the course on its head and using unconventional characters to drive the narrative. One of my favorite examples came from a community discussion by Joe Deegan. Joe was seeking design ideas for a bug bed prevention course. Dozens of users chimed in to share design and storytelling ideas for the course. The big idea that stood out came from a user who suggested that the course be told from the perspective of the bed bugs. In other words, what types of conditions and environments would most appeal to bed bugs. Instead of the usual storytelling approach, the big idea was to use anthropomorphic bugs to lead the training. Anthropomorphism simply means attributing human characteristics to animals (ducks, bears, bugs) and non-living objects (cars, toys, lamps, legal documents ). In addition to movies, anthropomorphic characters can be found in books, advertising, and most importantly, education. Here’s a good example from Rachel Craig of how easily a conventional course can be reframed so that a product is the primary character. 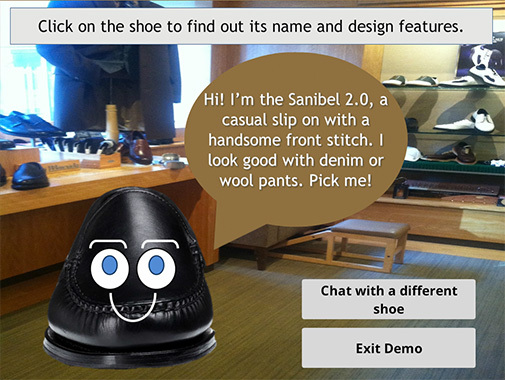 The example features a series of anthropomorphic shoes that help train salespeople on how to match shoe models and styles to customers. Each shoe played a role in the course by describing its history, unique design features, and when to choose each model. Pretty cool, right? 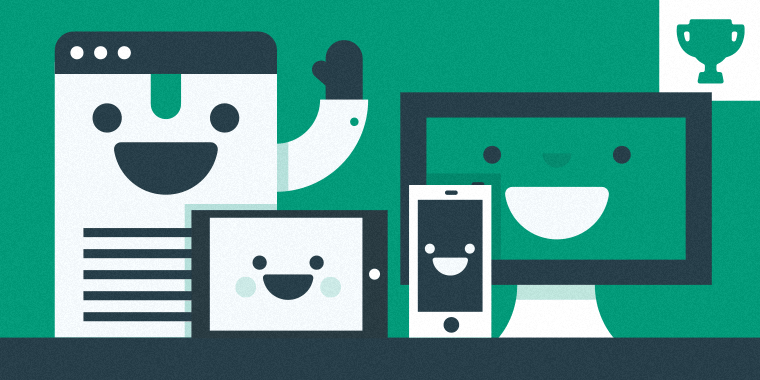 This week, your challenge is to share an e-learning example using one or more anthropomorphic characters. You’re free to use an existing project or create something new for the challenge. The goal is to show how anthropomorphism can be used as a storytelling device in e-learning. Great idea, David! I think he'll be doing some promotional interviews once it's released, too. I could almost see your characters come to life communicating with each other. Cute Jackie ! That's a pretty rad conflict management course Jackie! Wow! That is impressive! I love it! Jackie, your entries are always a feast for the senses, and one's sense of humor. Love it. Very animated approach! Love it! I really like this Jackie, this would be great in employee orientation training. You nailed it. Your creativity is off the chart. Love it. Very creative! I like the voice over action! Alexander I don't know what's funnier, your color descriptions or your delivery. Had me rolling here! Love it. Hilarious, you had me at the first colour name! All I can say Alexander, is, "just too funny". Oh, one more thing...great production! I like how the learner can choose their colors, I will defiantly use this in the future.thanks. Loved them both. I think, though, I'm developing a crush on robosapien. Those dance moves are hypnotic. Love the learning oracle Alexander! I clicked out of curiosity, and stayed for the humor. That learning oracle's one funny storytelling anthropomorph. Great branching story arkadiusz, does the potato ever get out of the hole? Maybe episode 1 as the rise (it treats as Intro) :) but may hole interestingly hides secrets. Hi everybody, this is my first time to join the challenge. Hope I got it right. http://www.teacherrambo.com/_ELHchallenge/113-Anthropomorphic/story.html Would love to hear your comments. Welcome Rambo! 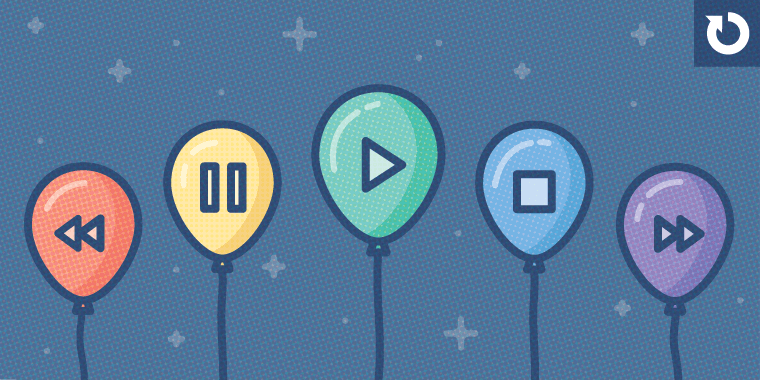 You definitely hit the mark on your first ELH Challenge. You created a pretty easy to follow and interactive timeline. On a separate note... If we discuss content, Nokia and Nokia-like phones didn't come around until the 90s ; ) Dang! I just dated myself. Oh dear, Alexander, you are right. I'll fix it right a way. Thanks for the heads up. Clean, simple to navigate and very interesting way to deliver the information. Well done, Rambo! I love the timeline! Super cool! Your phones had a ton of personality! Well done Rambo, that looks really nice! Here is the file https://www.dropbox.com/s/wy1b9ge7tfcm33t/Animorphic%20Challenge.story?dl=1 There is an easter egg if you get the sequence right! Thanks for sharing your file, Phil. Loved how your entry made vintage computing seem fresh and new once again. 8 was my best score, but then again, I wasn't very good at Pac-Man either. :) I always enjoy viewing your work. This is brilliant. War Games was a fav movie years ago. He's adorable Phil...Did he just wink at me :P Loved it!!! I was flashing back to War Games, Phil. Nice interaction. That's a good idea, I like it. Thanks for all the positives, I have no idea what the maximum score is on the game, I can get between 8 and 9 and on a good day. Fun and colourful, Phil. I liked that I could choose my colour. Didn't do well the first time but will try again. Thanks. Ha! Love the Easter Egg. Clever Phil! Ha! Glad you found it! Great game Phil, I couldn't get the Easter egg. Hi Julia, the easter egg shows my age, on the colour select screen play each audio file from left to right in order and the ensure the last audio file complete (for some reason you need to do this twice sometimes) and it will play. I LOVE it Phil! The colour scheme and design are beautiful, so simple and classy, great job! Nice idea Lyn, great interface. Firstly, what a cutie! Loved the idea! Funny too. Nice Lyn! Hi Lyn, great idea, loved the interface. Here's my challenge for the week... exploring chemistry. https://googledrive.com/host/0B8NHHWkmIPE6eGN4dW1tX1RLcVk My blog post is here: https://mlisterconsulting.wordpress.com/2016/01/17/elh-challenge-113-anthropomorphic-characters-in-e-learning/ Would love to hear any feedback or reactions. Nicely done Meaghan. I'm sure the kids would prefer this kind of exploration of the periodic table. This was engaging as well as informative. Wish they had taught Chemistry like this when I was in high school. My grades might have been better. I've used sitepal quite a bit, so glad to see a shout-out here.. One thing I do to get around the embed element, which as you point out can be a bit wonky with some browsers, is to screen capture the output and then insert it as an MP4 into whatever I'm using it for. That's a pretty awesome idea David, however, don't we lose the character interactivity with that? SitePal also has a straight HTML code with no Js which would probably work across browsers. I definitely like your approach as a work around though. I just set up the interactivity with triggers in Storyline. Now, I haven't done anything fancy, but it can still recreate the dynamic. Agreed about the HTML code, but it seems like Sitepal hasn't been too on-the-ball about keeping up with browser versions, so I just find it a safer option to go with the MP4 with the goal of keeping the "talking avatar" intact. Alex that's awesome! I love the news show/panel interview approach. I'm missing my old husky right now. Great dogs but their attention span is about as short as it gets in a dog. Thank you David, I miss my husky too, he was all white with blue freaky eyes. I liked the layout. Would love to know how you moved the mouth. Desna is cute and I liked the script. Nice Alexander! The beauty of it is you don't have to do anything Daniela. SitePal does it all ; ) Thank you for the awesome feedback everyone. I love your idea...so much that I considered a talking lemon in the kitchen for my entry as well. Your example is fun, friendly, and intuitive and I loved the color scheme and your photo choices. Nicely done Heather! I love lemons, especially the ones in your project! Makes my mouth pucker ! I like the dancing cat. It's similar to the rotating iPhone 6 interaction I was looking at on this site yesterday. I'm assuming to create it that you just layer pictures carefully over top of each one to make it look like they are turning. Thanks Tanya. I will have to try that. Oh goodness! That cat is awesome! So much creativity! So much cat-tastic goodness going on in this "Kitty Perry" example, Tanya! Loved the dance sequence, the music makes it special. I concur with Linda. The dance part was absolutely awesome. I have the cat moving fast by running the slider back and forth quickly. Love love loved it Tanya! The interactivity is awesome, the content very funny and the overall look is very clean and sophisticated (not unlike those judging felines). I played it several times. And thanks Tanya for pointing out that you started with one of the free templates -- sometimes it's difficult to envision what they can become but your example does a beautiful job showcasing that potential. Thank you Lyn - I never start from scratch if I can avoid it! If I can turn a job interview into judging cats and dancing kitty perry, then that's proof you can do anything with our templates, LOL! Thanks SO MUCH for the kind words, ya'll! It's only my second ELH challenge ever, so I feel pretty happy and motivated to play again. :) And Zsolt, now that you have made me into a Vine, my life is complete! Well Tanya, I have to say it: You took me by Storm ; ) The ContinMew button was genius and the whole demo was totes cray cray like a boss! LOL Thanks Alexander! A fine compliment, considering the sense of humor yours displayed! I love this one. Welcome human.... very funny stuff! I agree. At home,though, I don't try to find my broom. If it's not handy, then the sweeping doesn't get done. This is a great example. Good job. Cute and interactive! Where can I get one of those brooms? Never felt better swiping dirt... Very cute! Super Cute, I feel this could be expanded and used as a great game to teach children what to clean when cleaning their rooms! Ashisome, Ashimazing, so fresh and so clean! I liked that Ashi! Can I get one of those brooms? Very nice! I enjoyed your example very much! Very nice Ashi! So entertaining, and great design! Nice idea Mushtaq, "clippy" was a great little guy. I knew nothing about Twitter so this taught a lot. Nice. I like the "Woody" name. You can even give some woody personality. Not sure, maybe a little bit of a "dry humor"? Great job Roxanne! I liked your design very much. Hilarious! I love the humor in each of these! The ginger bread man story was great, I really felt for him. Your skills are incredible. Your examples inspire me to keep creating. Loved Ginger. Nice Linda! Have to say the crunchy sound was creepy, but effective. Always like a search and find game. Yes. The crunchy was creepy in a cool way. Loved it. And, I liked the way you presented the results or gave me the chance for getting help. very cute and creepy, I hope I never meet up with bed bugs. That makes two of us, Julia! Joanne this is very nice, my son loved it. Fun, colourful, and loved the expressions. Nice work, Joanne! Thanks for all the positives, my kids like it too. This is a good idea for engagement. I also liked the facial expressions. It added another interest element. I'm still new at Storyline. Did you use simple triggers and layers for this? Hi Debra, I am glad you like it. I used simple triggers. I will share my story file and you could take a look at the triggers. Thanks Linda. Could have put more into it as I had all these ideas but time is precious right now for me and have to regain my SL skills. Preview caused me grief today so I stopped at this. I did not apply the true meaning of anthropomorphic (non-human), but in some ways I did. Babies can't have these types of conversations (or can they?). Very cute Daniela. Sometimes I have trouble previewing bigger projects, think its just my computer, once the videos are compressed after publishing it works fine. Here's mine; https://googledrive.com/host/0B9Yp98HOToi1WnZ5UFFCZTJiaGs Hopefully its okay, I struggled with this theme. I found this totally mesmerising Julia - well done! Just one tip - the timing of the transitions could be a bit slower - I found I was having trouble keeping up with reading the words - this is a tricky one and something I struggle with myself as everyone reads at a different pace. Really cool! From the news industry I got this tip once about timing: if you're really familiar with the text you show, double or triple time others will need for the first time. Double or triple depends on the length of the text and other factors like where the text appears. If it's the same spot, you need less time. If not, your brain needs to locate the text first before you can even start reading it. Thanks Zsolt, I will definitely use your timing tip in the future. Totally captured my attention. Did you create the falling leaves or was it part of a video? It took me a second to understand the tree was the narrator. After I made the connection, it was compelling. Hi Debra, Thanks for the great feedback. The leaves are part of the video, unfortunately I dont have the software to create effects like that. I was thinking of getting adobe after effects, does anyone use this? Or is there something better? input from all would be appreciated. Hi Julia, I just completed my first lynda course on after effects and it looks pretty promising, that is, in terms of using it with e-learning and storyline. I know quite a few people in this community use it and create some great effects. Thanks for your feedback Veronica. Here's my entry for this challenge. In contrast to Julia, I had so many ideas for this theme - initially I wanted to do something on M&Ms as I find the ads for this product hilarious! Then we went to the beach on Sunday and I wanted to create a character based on a sand bucket that showed you how to build a sand castle...but eventually I settled on this character - prepare to meet Penelope who is going to talk to you about potatoes. Here's the link to the blog post where you can also view the demo: https://hopedianne.wordpress.com/portfolio/anthropomorphic-characters-in-e-learning/ If you're wondering about the topic, we grow potatoes on our farm and it's hard to escape conversation about the potatoes at any given time of day, or season of the year! I thought it might be fun to put some of this knowledge into the beginnings of a course. Enjoy! What a good idea. I loved the comparison between the hostess potato and her friend, the real potato. The format was simple and still kept my interest in finding out more. Loved it. Thanks Debra - I really appreciate your comments. Thanks for taking the time to let me know Daniela - much appreciated. Thanks Julia - yes, we live in the south eastern suburbs of Melbourne - and from a global perspective I always say "Melbourne" when I'm letting someone know my location. Our farm is 30 minutes away from our suburban home - and my husband commutes to the farm - we moved off the actual farm 12 years ago to get a more balanced view of the world!! However, farm conversation still dominates and Ian will always be a farmer... I'm hoping to give Pete a go at some point...so no need to feel too sorry for him! Sounds like a great way to get a balance, best of both worlds. Personally I prefer the country, I lived and worked in sydney for 8 years after uni. Now its a great place to visit for one or two days but Im so happy to get back home to the country! Is that 1st link your work? That was an amazing piece, really top notch. No :), the credit for the first version goes to google. It is really amazing. I loved that Google Doodle Marcus and wanted to make something from that too! I liked your course, but found it a little frustrating that the game ends if you don't know the first note. I gave up after two attempts. Perhaps if you gave a hint when the wrong key is chosen, or give them the option to try again without having to go back to the beginning. Hi Linda, sorry I didn’t intent to make it frustrating. It’s just a demo version, so every key destroys the piano :) (I should have mentioned that). I’m working on a real version, but I’m building these courses in my free time so it will take much longer till it’s finished.